When you're off on a camping trip, you'll want to make sure you label all of your backpacks, tents and other gear that might accidentally get left behind when you pack up and move on. Because our dog tags are made from military grade stainless steel, they can keep up with all your rugged outdoor activities. 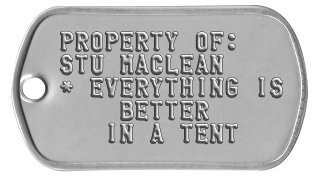 Have some fun with your tags by adding a clever camping quote. 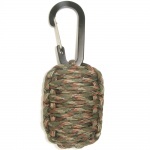 We also offer a wide selection of survival gear including paracord survival bracelets, howler whistles, can openers, fire starters, compasses, and much more all of which can be added to your camping gear ID order. You may also be interested in our camping and survival gear. There is nothing I love s'more than camping! Customize to Buy your Camping Gear Dog Tags now! Protect your expensive gear and equipment with durable and water proof dogtags. Lost or stolen property has a better chance of being recovered with proper identification. Perfect for keys, luggage, briefcases, sports bags, golf bags, backpacks, purses, lunch boxes, gun cases, tackle boxes, tool kits, etc. 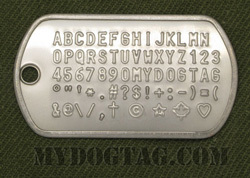 Use the first dogtag for identifying information and the second for your favorite quote about your sport or activity! All orders are shipped within 1 business day and are usually delivered within 1 week (in North America). 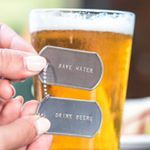 If you need any assistance creating or ordering your Camping Gear Dog Tags please contact us directly, we are here to help!